Embattled Chicago Schools CEO Barbara Byrd-Bennett has links to another private education firm which did business with the Chicago Public Schools, and in 2011, auditors in Detroit investigated still another potential conflict with one of the world’s largest textbook companies. When she was hired as Chicago schools chief three years ago, Byrd-Bennett listed a company called Catapult Learning, where she said she was employed as Senior Advisor for Planning. Last September, Catapult was listed as one of 60 vendors on the receiving end of a three-year agreement to provide professional development services to the Chicago schools at a cost of $66 million. Byrd-Bennett was one of three signatories to that agreement. A CPS spokesman noted that the Catapult agreement was competitively bid. And indeed, last week, School Board President David Vitale noted the challenge of navigating the procurement world for professionals who have been engaged in education for any significant period. "Many of us have prior lives in which we’ve engaged with organizations with which we no longer have relationships, which can still provide quality service to the Chicago Public Schools," Vitale said. On her resume, Byrd-Bennett listed prior relationships with at least five such entities. In Detroit, where she served as "academic auditor," officials commissioned an official audit to determine how federal funds were used on a trio of high-dollar contracts. As part of that investigation, it was determined that Byrd-Bennett had worked as a "superintendent in residency" at one of the vendors, Houghton Mifflin Harcourt, which she had not revealed on her financial disclosure documents. The Detroit schools had contracted with the company for a variety of services, listed as "managed instruction and professional development" as well as "supplemental textbooks," at a cost of $52.3 million. 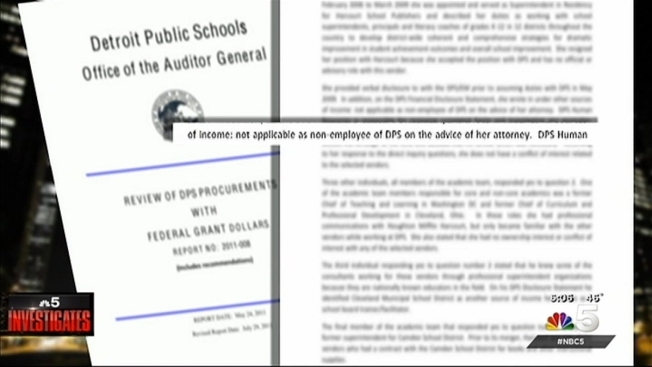 According to the auditor’s report, in a section of her Financial Disclosure asking for sources of outside income, Byrd-Bennett wrote "not applicable as non-employee of DPS (Detroit Public Schools) on the advice of her attorney." A source in the Detroit Public Schools who asked that his name not be used said the investigators determined that no conflict existed because she was technically a contract employee and thus correct that she did not have to answer the conflict question. On Monday, CPS released an internal memo from interim schools chief Jesse Ruiz, calling for an outside firm to evaluate the process by which SUPES Academy received a $20 million no-bid contract to provide training for Chicago principals. "Every dollar is critically needed in our classrooms and we need to ensure not a single penny is wasted," he wrote. Ruiz said he was ordering a halt to sole-source contracts at the district, pending the findings of that audit, and had asked CPS legal counsel to prepare options to terminate the SUPES contract if any wrongdoing was found. "As public servants, our highest priority is ensuring integrity and honesty in everything we do," Ruiz told staffers in the memo. "I hope these actions will make clear to both you and the public that we take this responsibility seriously." Also Monday, Mayor Rahm Emanuel offered Byrd-Bennett qualified support. Hailing the work she had done in the district up to this point, he said, "Without a doubt, given the investigation, she needs to be focused on that."